Prof. Billington began his studies at Princeton University in 1946 where he enrolled in a program called "Basic Engineering, and earned his BSE degree in 1950." After graduation, he received a Fulbright scholarship that enabled him to spend two years in Belgium, where he studied postwar engineering innovations. In the second year of his Fulbright scholarship in Belgium, he studied with Professor Gustave Magnel, a major figure in the development of prestressed concrete. Upon returning to the United States, he worked as a structural designer of bridges and buildings for Roberts & Schaefer Co. in New York from 1952 to 1960. Billington joined the Princeton faculty in 1960.In his early years at Princeton, Prof. Billington taught a structural engineering class to students of architecture, who asked him why structures could not be studied through examples of beautiful works. He found the idea of teaching through elegant examples (rather than abstract line drawings) very appealing. His courses combining the study of engineering with an exploration of aesthetic and social values, have been some of the most popular among engineering and non-engineering students for decades. This simple event launched Prof. Billington on a new course of scholarship that would define a new field - Structural Art. He began to analyze the humanistic side of civil engineering through conferences that brought together leading designers whose works exemplified the integration of elegance into engineering structures. Then in 1974, Prof. Billington began teaching "Structures and the Urban Environment", a course that traces the development of outstanding structures that arose with the Industrial Revolution and the introduction of new materials - industrialized iron, then structural steel, then reinforced concrete and finally prestressed concrete. In this course, he emphasized the creativity of the engineer along with the technical content and he showed how efficiency, economy, and elegance can be integrated in the best civil engineering structures. This integration became the central tenet of Structural Art. 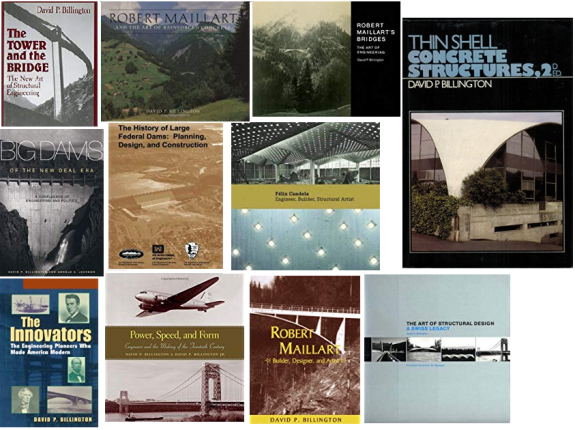 The course made use of Prof. Billington's scholarship on "structural artists" and their most important works. His research at Princeton has focused on the engineering of large structures, including the design and rehabilitation of bridges, thin shell concrete structures, tall buildings and concrete dams, often with an emphasis on the intersection of efficiency and beauty in structural design and the transformative influence engineers have had on American society. He served as director of Princeton’s Program on Architecture and Engineering from 1990 to 2008 and was named the first Gordon Y.S. Wu Professor of Engineering in 1996. Soon into his academic career, he wrote Thin Shell Concrete Structures, a seminal text published in 1965. The book is full of partial differential equations solving equilibrium for various thin shell forms - with and without bending stresses - that established him as an authority on thin-shell structures. His scholarship, work as a consultant, and leadership as Chairman of the ACI-ASCE Joint Committee on Concrete Shell Design & Construction (1973-79) helped define standards and means for designing thin shell concrete structures around the world. His seminal book, The Tower and the Bridge, published in 1983, summarizes this scholarship and forms the foundation for the course. The book has been translated into Japanese, Spanish and German and is a classic in the literature on the philosophy of structures. Prof. Billington also brought this approach to the wider profession as the founder and Chairman of the ASCE SEI Committee on Aesthetics in Design (1978-85). In addition to several courses and books - designed for a general audience - Prof. Billington curated eight museum exhibitions, most of which traveled to various museums and abroad. His books include “The Art of Structural Design: A Swiss Legacy”; “Power, Speed and Form: Engineers and the Making of the 20th Century” with his son, David P. Billington Jr.; “Big Dams of the New Deal Era: A Confluence of Engineering and Politics” with Donald C. Jackson; and “Félix Candela: Engineer, Builder, Structural Artist” with Maria Garlock, a colleague in civil and environmental engineering. Billington has earned numerous honors for his scholarship and teaching, including three Engineering Council awards, the President’s Distinguished Teaching Award and the National Science Foundation Director’s Award for Distinguished Teaching Scholars. He was elected to the National Academy of Engineering in 1986 and is a fellow of the American Academy of Arts and Sciences. He received honorary doctorates in humane letters from Union College (1990), in science from Grinnell College (1991) and in engineering from the University of Notre Dame (1997), and Princeton University (2015). In 1999 he was named one of the top five educators in Civil Engineering since 1874 by the Engineering News Record. The Fulbright grant also enabled Prof. Billington to meet and marry Phyllis Bergquist, a Fulbright scholar studying music, who became his principal support in life. Thanks for sharing this, Dr Subramanian! Truly appreciate this. I think this inspires all of us to look beyond the most obvious to create something which will is well -designed, both as a piece of art and technology. Thank you Er Alpa Sheth for your appreciation. In fact, I knew about his death by chance. When Dr Ramprakash came here and asked me to suggest some good engineers/architects who can speak on the history of Civil Engineering, I suggested Prof. Billington's name. But when I browsed the Net I found that he passed away recently. Thought that other engineers should know about Prof. Billington's important contributions to the Structural Art. On this Diwali day I wish you and your family and all the SEFI members a very happy, healthy, and prosperous Diwali! My earlier reply did not appear on the forum, but it was to thank you for engaging me for 4 hrs of excitement going thru videos on the exhibition :"The art of structures" - A swiss legacy and further links to other masters of the profession. Made me wonder where are the Indian counterparts to such wonderful phenomenon. Where is the passion and the brilliance amongst teaching faculty of our civil engg. colleges in India. How can we upgrade our education system. How can we develop an environment - both in colleges as well as work offices to be able to produce structural engineers who can work with similar creativity & enthusiasm. As a start may I suggest a greater interaction between the field practice and the students. Senior practising professionals to reach out to colleges & present interesting case histories of their work, involve interested students in professional work, give out summer internships etc. Let us all play a part in raising the bar. Thank you again and keep us in touch with those heights. My heartiest gratitude to Mr. Billington, he was a honorable professional in the field of Civil Engineering. I have read some parts his book 'Tower and Bridges', really appreciate his contribution in the field of Civil Engineering and recognising the essence of artistry in design and technology. There are such Maestros in Bharat as well but they are hardly recognised! Our colleges and schools rely on piece of paper saying that so and so person is Master of Tech. (aka higher desgrees) than on a person's experience hence many brilliant Engineers who are in practice and apply, validate, develop the Engg. concepts stay outside of Educating students. Also seniors/management in many Consulting organisations are busy squeezing costs for clients and adopt regressive cost measures and this results in no budget/hours allocation for innovation, people who even want to do something new are often seen as eyesore in such organisations and are sidelined.